The WBAI elections are once again upon us. What’s really going on? Voting in the current WBAI radio election to the Local Station Board is taking place with ballots due no later than March 5, 2019. All of those listener-members have pledged to support keeping WBAI as a listener-sponsored station and to oppose leasing it, selling it, or swapping the signal. Please vote for ALL of them, in that order. The faction known as “Justice & Unity” has publicly called for WBAI to be leased out to Dan Coughlin and Manhattan Neighborhood Network, who in that circumstance would run and control WBAI, never to be heard from again as an independent radio station; or, you can vote for independent candidates for the Local Board who oppose any sale, lease, or swap of WBAI, with the hope of strengthening — not breaking up — the Pacifica network. We must come down hard on the side of opposing the leasing out, sale, or swap of WBAI, and urge members — some 8,000 of us! — to reject any candidate who wants to give the station away to MNN or any other corporate entity. That means to vote only for independent candidates, and to withhold your vote for every single Justice and Unity candidate, even if you like one or two of them for other (activist) issues, because this question is soooo important that it overrides every other consideration. The reason? The Local Board will vote on who to send to the Pacifica National Board, which makes the final decisions on these sorts of issues. So we need to gain a majority of seats on the Local Board in order to elect people to the National Board who will keep the network intact and oppose the leasing, sale or swapping of WBAI to any other entity. Yes, there are other issues too: Mitchel Cohen and independent candidate Alex Steinberg worked tirelessly to free WBAI from the onerous lease with the Empire State Building, saving the station $700,000 per year. Alex, as one of WBAI’s representatives on the National Board, was able to work with others there to arrange the $3 million loan that pretty much saved the station and the network. Many said “it can’t be done”, but Alex and other independents found a way to make it happen and prevent the collapse of the network, to the chagrin of the Justice and Unity faction which had publicly stated that they wanted to force the network to lease out WBAI to MNN. At the same time, Mitchel was scrambling to find a suitable and inexpensive space for WBAI’s studios, which resulted in moving to our current location at the Brooklyn Commons, 388 Atlantic Ave. I worked to coordinate volunteers for WBAI to send out the back-logged premiums and to do the work and get things done. Independent candidate, Maxine Harrison-Gallmon, was one of those volunteers. She came to the station every Friday and worked many hours each week to try to resolve problems that listeners had. Maxine is an unsung HERO of WBAI. Another candidate, Marilyn Vogt-Downey, a retired school teacher, donated substantial funds to help save the station, resolved problems with premiums, and tried to hold management’s feet to the fire to get things done. And Jim Dingeman — true, he talks talks talks, sometimes frustratingly, but also walks the walk. 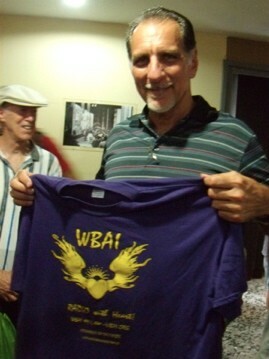 Jim chaired WBAI’s Community Advisory Board, which was (and is) required for the station to to receive funds from the Corporation for Public Broadcasting. Note: Pacifica and WBAI lost almost $4 million in CPB funds when the required audits of the network were sabotaged for 4 years, due in part to incompetence and also to collusion by those wanting to lease out the station, which would be facilitated by driving the network into the ground financially. We’ve managed to rectify most of that, and we’re on the verge of saving the network, but need your vote. Please do not vote for ANY Justice and Unity candidates even though there are some people there that I personally like in other areas, because they have stated that they want the station to be given away to a separate corporation, which would break up the network and end listener sponsorship of WBAI. Once we achieve that, then we can move onto the other great ideas for improving programming, expanding listenership, raising funds, and fighting against fascism in this country. We can’t do any of those things unless the listeners and staff maintain control over WBAI and Pacifica. If you are a member of WBAI and did not receive a ballot (the requirement for membership is that you’ve contributed $25 or more in the year preceding November 19, 2018, or did at least 3 hours of volunteer work for the station), please click HERE and fill out the form, ASAP!